Boykin Series 22 Presents: C.J. 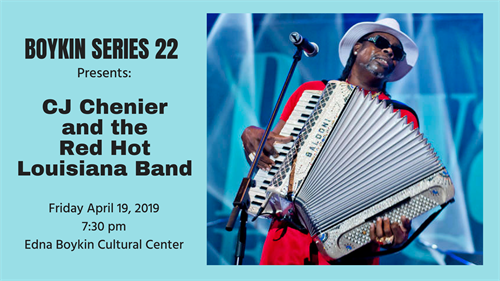 Chenier & the Red Hot Louisiana Band - Apr 19, 2019 - PublicLayout - Wilson Chamber of Commerce, NC ? C.J. Chenier is a Grammy-nominated and world-renowned Zydeco musician and recording artist who has performed alongside many internationally recognized musicians including his Grammy-winning father, Clifton Chenier, “The King of Zydeco”. He has also performed with such musical greats as Paul Simon, Joe Sample, Ray Parker, Jr., The Gin Blossoms, and John Mayall, and is currently on tour with his own group, the Red Hot Louisiana Band. C.J. has performed at many large festivals such as the New Orleans Jazz & Heritage Festival, Chicago Blues Festival and Austin’s SxSW Music Conference. In addition to his Grammy nomination, he has received several major awards including the Living Blues Critics’ Poll Award, Indie Award (from AFIM) for Best Zydeco Album, Coups de Coeur (Blows of Heart) Blues Category Award from l'Académie Charles Cros (France), and Best of the Beat Best Zydeco Album (Offbeat Magazine).